Bell And Howell Totally Automatic Ad 1956 This is a December 10, 1956 advertisement It is a nice black and white ad from Bell & Howell of Chicago. Ad shows folks looking at slides and it reads, ""New Robomatic not only shows slides for you, but lets you time them by remote control. It's totally automatic."" Also shows the camera. In excellent condition. Photo is taken through plastic and may show wrinkles or crookedness that is not in the ad. This magazine tear sheet measures 5 1/4"" wide by 14"" tall. 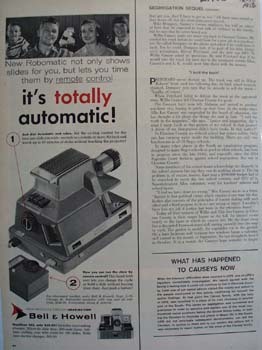 Items Similar To "Bell And Howell Totally Automatic Ad 1956"